It's that time again over on Young House Love for the very fun Pinterest Challenge. I love a good challenge and I've been pinning like crazy lady lately. Since I'm redecorating the kid's rooms I thought it would be fun to paint the dresser in the boy's room. Here is what it looked like before I got my hands on it. A little background. I bought this dresser for $85 at a flee market 6 years ago. The brand says "ModernAge" in a cool retro font. 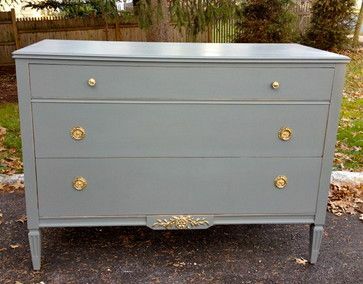 The color is light green with an antiqued finish and it's a vintage dresser but in great condition. It needed a few facade pieces on the front sealed up and the doors needed new screws, but other than that it was the perfect piece of furniture to refinish. Here are the inspiration photos I pinned on Pinterest for the colors I liked. Basically I was loving the gray finishes with gold hardware. So the budget conscience person that I am these days told me I should go ahead and scrounge up some gray paint that I already had and mix them all up to come up with a new shade of gray. So that's exactly what I did. For the hardware, I bought a can of gold spray paint by Valspar from Lowes. I really love how it turned out and it's hard to tell by these photos but it has a very glossy surface. My favorite part has to be the gold hardware. It makes it look very fancy. Just for fun I painted the inside doors "Weathered Glass" by Valspar. 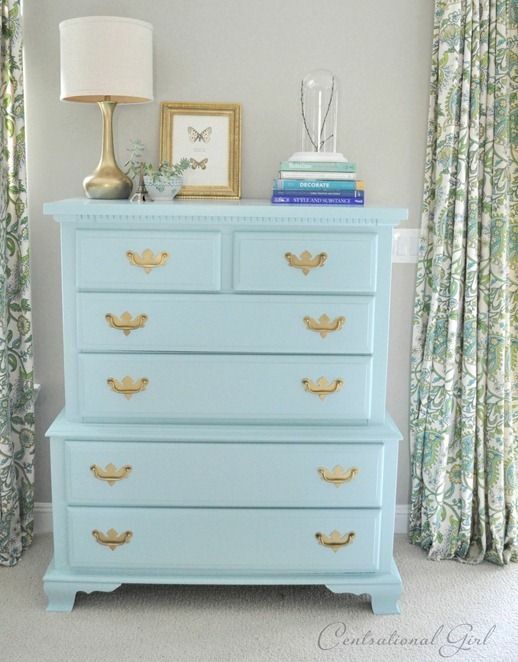 Originally I was going to paint the whole dresser this color, but decided against it. Wanted to stick with a neutral. Now I can't wait to finish up the rest of the boy's room! 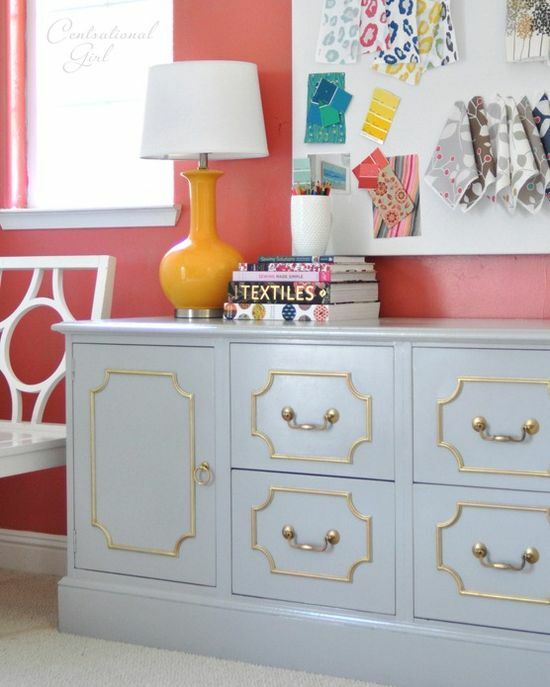 Hope you enjoyed this furniture makeover!